Dr. Suri is a gynecologic oncologist in the Department of Obstetrics and Gynecology at Houston Methodist Hospital. He grew up in Knoxville, Tennessee and received his medical degree from The University of Tennessee in Memphis in 2006. He completed a four year residency in the Department of Obstetrics, Gynecology, and Reproductive Sciences from the University of Texas Medical School in Houston Memorial Hermann Hospital. While a resident, he completed a one month Felix Rutledge Fellowship at The University of Texas MD Anderson Cancer Center and won the J. Taylor Wharton Award for Outstanding Resident in Gynecologic Oncology. After completion of residency in 2010, Dr. Suri completed his Gynecologic Oncology Fellowship at the University of North Carolina Hospitals in Chapel Hill, North Carolina. 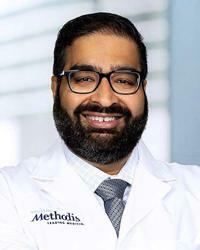 During his training, Dr. Suri won several awards including Best Oral Presentation at the Winter Meeting of the Society of Gynecologic Oncology in 2012, the ASCO Merit Award at the 2012 American Society of Clinical Oncology Annual meeting, and The Golden Tarheel Award at The University of North Carolina. Dr. Suri has conducted basic science and clinical research covering topics such as ovarian cancer, granulosa cell tumors of the ovary, and vulvar cancer and presented his research at national conferences. Dr. Suri has extensive surgical and clinical training in the field of minimally invasive and robotic surgery.